Credit Repair Reviews from White Jacobs and Associates. Real Reviews & Real Results from Past Clients. We value our reputation tremendously. It’s all word of mouth. Take a look at what people have to say about us. “…What can I say, I’m really impressed with their service. After using Lexington Law for a while things kept coming back to my credit so I decided to give White Jacobs and Associates a try. I’m blown away with their service! I can’t believe they deleted all my collections. I’m at 670 credit score and I applied for a credit card which was approved with a credit line of 8,000 dollars. Before this, I’ve never had a credit card limit higher than 300. It takes discipline and patience but you can get there. Right now my wife and I are looking for a house to buy – our dream come true. Thanks White Jacobs – Im forever grateful. “For the past 3 years I have been subject to crazy high interest rates on automobiles, denied home loans, and even unable to move into a decent apartment all because of a broken lease that should not have existed. With the aid of White Jacobs and Steve, after a few months I have been absolved of my blemishes. I had spoken to other attorneys about resolution only to be met with ‘Maybe, Probably, and likelys’. These were much cheaper but I was unwilling to deal with someone who had no spine or faith in their own work. But, after just a few minutes of speaking with Steve Tansey it was green lights. He opened with a disclaimer, ‘you may not get the result you want’ but I can and will get this taken care of. 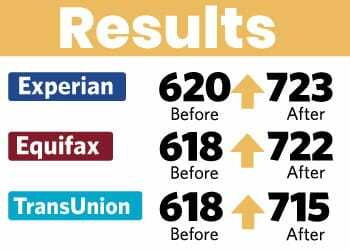 “I am so elated about the progress of my credit score. I’ve never written a review before and never really anticipated on writing one but I am so overjoyed about the results that I’ve received from White Jacobs & Associates and couldn’t keep it to myself. Unfortunately, I wasn’t taught about financial responsibility nor credit so this led to me making poor financial decisions and bad debt management. For so long I wanted credit guidance but refused to invest in a credit repair company because I felt as though I could of done it myself. In addition, I also thought that credit repair companies were scammers and wasn’t worth the investment. After working with White Jacobs & Associates, I know realize I was SO wrong! My entire adult life, I have been penalized and paid extra in interest due to my poor credit, low 500’s. The breaking point for me was in September, I needed a new car and couldn’t get financing or lower than 22%. I knew at that point, something had to change. After researching several companies and reading reviews for other companies, someone mentioned White Jacobs and Associates in their post. So I begin to research them and read some really great reviews. Yet, I was still skeptical but decided to make the phone call out of curiosity. From the moment I spoke with Woody, I was impressed by his patience, knowledge, and genuine concern. Yet, I was still skeptical. After that initial conversation, I realized I gotta do something different to get something different. So I called Woody back and moved forward in the process in October. Although, I was forewarned by Woody that it is a process and can take so time, I still wanted immediate gratification. After 2 months of no results, I became skeptical once again. I reached out to Woody just last week after Christmas and asked him what’s going on? He assured me that they’re working on it and sometimes the bureaus take time to update. Due to receiving letters from creditors, I knew they were working on it but I felt like it wasn’t happening fast enough so once again, I was skeptical. Jessie wanted to stop wasting money on rent and move into a home. Amy wanted to buy a new home and also finance a car with a good interest rate. Let's talk and see if you're a good fit for our program. “My bad credit has been bringing me down my entire life. I made bad decisions when I was younger that hurt my credit and had some medical emergencies that I couldn’t afford. Because of all of this I have always paid hefty deposits for my apartments, my insurance has always been expensive, my interest rate on my vehicles have always been 16% or higher, and I even got turned down for a job a few years ago. I guess I just got used to it. I thought this is how life is. This was my punishment. I knew something had to change when I went to purchase my home. I was turned down for a loan from multiple companies. My highest score was a 528. The only place that would approve me was going to give me a 7% interest rate. I knew after all these years with high interest on my cars, that I just couldn’t even consider paying 7% in interest on a home. I couldn’t continue throwing money away for rent. I hated the neighborhood I was living in and, more importantly, I was afraid to let my two boys go play outside because on the neighborhood that we lived in. One loan officer told me to call Tyler at White Jacobs. I did research on the company and was very pleased with what I found. However, when I researched general credit repair online, I heard horror stories. I became really skeptical of the idea of credit repair. I just knew that I had to do something. I called Tyler. He told me that if he couldn’t help me he would tell me. That put me at ease. He looked over my report and said that I would be a good fit for the program. After he went over the report with me and answered all of my questions, I decided to move forward with the program. After 33 days I began to see results. I saw my scores increase and collection accounts deleted. Tyler kept me in the loop the entire way through the program and answered all of my questions. He set me up with two credit cards and taught me how to manage them. This was exciting for me. I haven’t been approved for a credit card in years. Greg and his wife wanted to qualify for a lower interest rate on their new home. Ray and his wife wanted to qualify for a conventional mortgage as a first-time home buyer. “First I would like to start by saying I tried many credit repair companies but this one right here is the truth although they are expensive but for the results they are by far are worth every dollar. “What an amazing company to have on your side! I had an issue with an unscrupulous collection company that had reported a collection on me that unfortunately severely compromised my credit score. My fiance and I were trying to buy a house and I needed my credit to come up tremendously in order to get the best rate for us. When I got in contact with LeAnn, my score was a lousy 642. Because of the collection issue, I started working with LeAnn and White Jacobs and Associates and after only SIX short weeks, the derogatory information was removed from my credit report! 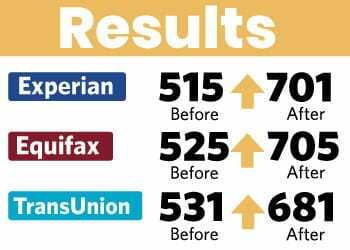 Even after the collection was off my report, LeAnn continued to advise changes that I could do for my credit portfolio to boost my score even more. 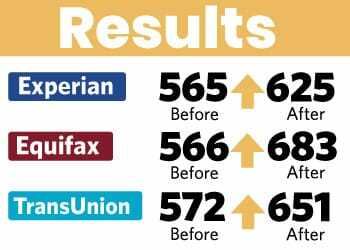 Truman was moving to another city and was not able to get approved for a home with this credit score. Jason wanted to move out of his apartment and buy a home closer to work. Have questions? Talk to one of our Credit Analysts. “My wife and I have been struggling to repair our credit. Due to seemingly paralyzed credit scores, we haven’t been able to buy the things we want, i.e. a home, without being rejected by a numerous amount of lenders. After being referred to White Jacobs and Associates, then speaking with Allan, we decided to give the program a shot. They are confident in what they can do, and for that reason, we believed them and took the chance. We’re now only in our first week; Allan is knowledgeable and has been more than helpful, even offering two hours of free consultation time. That said, I’ll report back at the end of this program with the full experiential review. Our hope is to qualify for the ‘dream’ home that we are ready to build. “5 Star without a doubt. My credit was in very bad condition and I was really embarrassed and concerned about my future regarding my finances & credit. With bad past financial difficulties and poor decision making my credit got way out of hand. My wife and I were trying to purchase a home but were being held back by irritating credit issues. We were recommended by our Residential Mortgage Lender that is helping us get into a home, to Edward with White Jacobs and Associates to help us resolve these credit issues. I have to say hands down from the very first phone call that Edward has been very proficient, from the beginning he explained everything well enough for us to understand the process clearly and has done a good job with communicating throughout the process. He has amazingly got my credit score above where it needed to be in order to move forward with the purchase of our home. Rosalynn needed to refinance her mortgage and get out of a high-interest car payment. Ivory had a growing family and needed to get approved for a bigger house. “ABOVE AND BEYOND!. 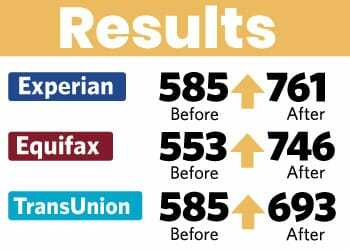 I currently live in South Carolina and my credit score was suffering mostly due to incorrect information on my credit report. 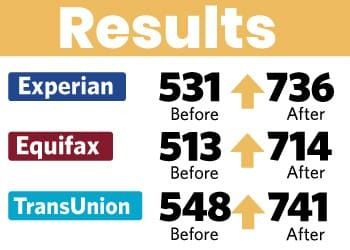 Unbeknownst to me, Credit Repair is ILLEGAL in SC (Speaking in terms of hiring one to repair it). Tyler himself was the one who informed me of this. Upon hearing this my heart sunk to the floor and felt completely helpless for I was seeking credit repair for approval of loan for the start up fees and licenses to my distillery and finally fulfill my dream of marketing my own brand of Craft Bourbon. Defeated, I thanked him for his time and prepared to end the call. He then asked me if had a email address and said he wanted to send some information to me. He continued to speak with me which was surprising to me, knowing he would not receive any monetary compensation from me but was still treating me like a paying customer. He gave me some information and requested that I call him back and inform him if I was able to remove the negative accounts myself. I had been researching for quite some time on how to do this myself with no luck really but he was able to properly direct me in a matter of minutes. I have now completed everything on my end and just waiting for the collectors and credit bureau to get back with me. “I have a working relationship with Derek and am also one of his success stories. He’s quick to respond with questions and knows his stuff. Let me start by stating that I have been a mortgage broker for nearly 15 years; so you can only imagine how many credit reports I have reviewed in that time. Here is a fact – not everyone has had perfect credit including myself. There are always different circumstances that land people in their current situation but you always have a choice to do something about it. 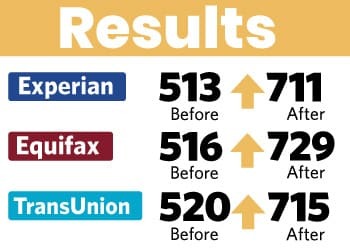 When it comes to credit repair; I have referred a number of clients and friends to Derek with great results. I, for one, would not send personal friends to someone unless I had 100% confidence that they would be treated well and the results were proven. After seeing how well Derek’s program worked for my customers; I decided to move forward with my own credit repair. “Over the past several years, my credit was not good; hovering around 565 or so (per Equifax). I lost all hope in getting good rates on loans and such. I knew I had to get my credit fix, but I didn’t have a process that could fix it in a timely manner. I vetted several credit repair companies and landed with White Jacobs and Associates. Allan, who I worked with, was so professional and thorough. He listened to all of my questions and kept his word on things that his company could do for me. He also educated me on the credit repair process and credit law in general. 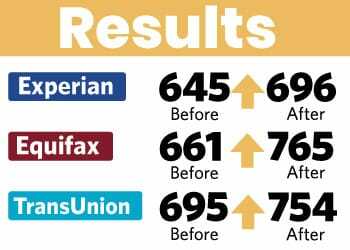 Well, in less than 3 months, my credit score increased by 152 points to 717! I was so excited I went out and purchased a brand new car for my wife, with a low interest rate.